Hi! My name is Tina Tapia and I’m an Army wife and mom of 4 little girls. The picture taken is myself 8 months pregnant in May, 2013 with my 11 month old Eden in back carry position. My husband was on a 3 month tour when I took this photo in my home. I was finding it hard to do everyday tasks and chores around my house being pregnant and alone, with my little girls running around everywhere. 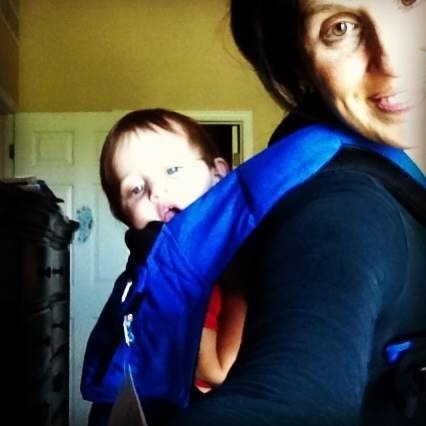 The carrier I have on is an Ergobaby. I really enjoyed it with my older girls but not so much with my newborn. It’s great for NIP, but a little too heavy duty for a little baby (6lbs at that). I love wearing my babies, I love the bond, closeness and the ability to nurse wherever and whenever.